KNOXVILLE, Tenn. (AP) — Tennessee’s Yves Pons felt no jitters as he showcased his athleticism in his first career start. Pons didn’t provide as much scoring as those two guys, but he made up for it with hustle plays to reward Barnes’ first starting lineup change of the season. The 6-foot-6 Pons grabbed an offensive rebound and sank a 3-pointer on the game’s first possession. He delivered two dunks off alley-oops and also produced a pair of blocks. “Everything he did tonight, he does every day in practice,” said Tennessee guard Jordan Bone, who had 14 points and seven assists. 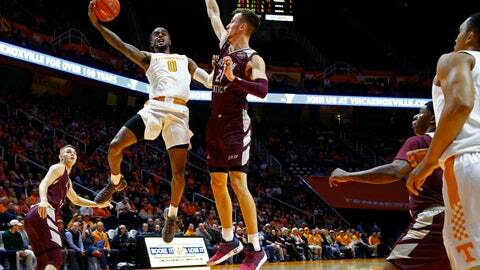 Eastern Kentucky (3-4) and Tennessee were tied 11-all seven minutes into the game before the Volunteers scored 13 straight points to pull ahead for good. After Lachlan Anderson’s 3-pointer cut Tennessee’s lead to 24-14, the Vols scored eight straight points to complete a 21-3 spurt. Pons’ energy played a major part in that surge. “I just think the more he plays, the better he’s going to get,” Barnes said. Eastern Kentucky: The Colonels entered the night averaging 86.3 points to rank 25th among Division I teams in scoring, but they struggled more than usual against Tennessee’s stingy defense. Eastern Kentucky shot 35.6 percent and posted its lowest point total of the season. The Colonels had reached the 100-point mark in two of their first six games. Tennessee: The Vols just got finished playing Louisville and No. 2 Kansas in New York and have games with No. 1 Gonzaga and Memphis later this month, so it would have been easy for them to overlook this matchup. That didn’t happen. Tennessee out-rebounded Eastern Kentucky 50-32 and had 18 offensive boards. … Pons missed all three of his free-throw attempts and is 1 of 8 from the foul line this season. … Mayo now has 1,755 career points, putting the Eastern Kentucky senior 77 away from Matt Witt’s school scoring record.